When Harold Thornbro was undergoing treatment for colon cancer, he was inspired to completely change his life. Homesteading, for him, was the path forward. For some homesteaders, growing and eating healthy food is more than a hobby: it’s a matter of survival. As a professional truck driver, Harold Thornbro had spent years snacking on processed fast food every day on the road when a stage 3 colon cancer diagnosis changed his trajectory. 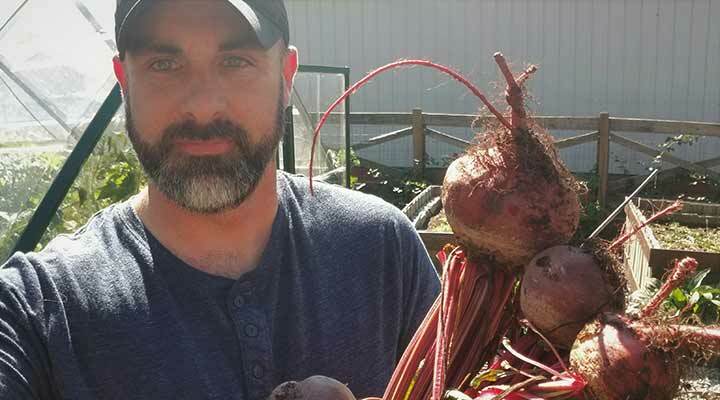 Even though exorbitant medical bills kept him from moving to the country home of his dreams, Thornbro has been able to grow his own food and start a number of homesteading projects on his small suburban property in Indiana. With his blog The Small Town Homestead and his podcast Modern Homesteading, Thornbro hopes to inspire other wannabe homesteaders to make that lifestyle change — no matter how much land they have — before it’s too late. He recently answered a few questions for Hello Homestead’s Behind the Homestead Blog series. Hello Homestead: Tell me about your background. Where did you grow up, and what did you do before you started homesteading? Harold Thornbro: I spent most of my childhood not far from where I live now in Indiana on a small homestead doing many of the things I still love. Dad always had my younger brother and me working with the cows, pigs, chickens, goats and occasionally other livestock. We always had a large garden and did a lot of foraging and hunting as well. Mom was big on cooking from scratch in my younger years, but as times changed there was a huge switch over to more processed foods, as many people did back then to save time in the kitchen. As I got into my teenage years, we moved from Indiana to Tennessee, where we lived in town. Many of the homestead skills I had acquired as a younger kid quickly faded into the background and I lost interest in that lifestyle for a few years. I didn’t stay a kid very long, though: by the time I was 22, I was living back in Indiana, was married, had three daughters and was running my own trucking company and dreaming about one day living a homesteading lifestyle again. HH: What inspired you to start homesteading? HT: The homesteading desire had been there since I was a kid, even though it moved to the back of my mind for a few years. My wife and I had always talked about someday getting us a small farm and raising some livestock and growing a large garden, but life was way too busy to do that at the time — or so we thought, anyway. Flash forward a few years: at this time, I had been spending most of my adult life behind the steering wheel of a semi tractor trailer, driving all around the country and eating extremely bad, sometimes eating fast food as many as three times a day with soda being my main source of hydration. Well, it finally caught up with me. In 2012, I was diagnosed with stage 3 colon cancer, and on my 40th birthday, I was receiving my first chemo treatment. I knew that the homesteading lifestyle offered all the changes that needed to be made in my life in order to eat healthy and get more exercise, so I decided to wait no longer and start homesteading right then, right where we were in town. HH: Tell me about your journey with cancer. How did that change your outlook on life? HT: This was a wake up call, to say the least, and I knew I had to make some major lifestyle changes. It was bigger than homesteading, though. It also inspired me to want to encourage others to change their lives by eating better and not waiting until it is too late to start living the life they wanted to live. I also started thinking more about how I could improve the planet and leave it better one day than how I came into it. This really made me think about organic gardening and avoiding toxic herbicides and pesticides. This new outlook on life took me down the permaculture path where I have discovered many lifestyle design practices that enable someone to make a real difference in their own lives as well as make an impact in the world. HH: What were the first projects on your homestead? HT: It all started with two small raised beds I built out of scrap wood where I planted what I called my salad and salsa gardens. I think that same year, I planted a couple fruit trees and planted a small grape vineyard. Pretty meager beginnings, but I just wanted to get started doing something no matter what it was. HH: After your medical bills, you write that you did not have enough funds to move out of the city and into the country. How did you manage to start homesteading on a one-tenth acre “postage stamp” city lot? HT: That’s exactly right. We were pretty much trapped financially right where we were, living in town with a small backyard. While I was sitting around recovering from my surgery, I had a lot of time to dream, think and research. I came across a YouTube video that changed everything for me: “Homegrown Revolution” from the Dervaes family at The Urban Homestead. 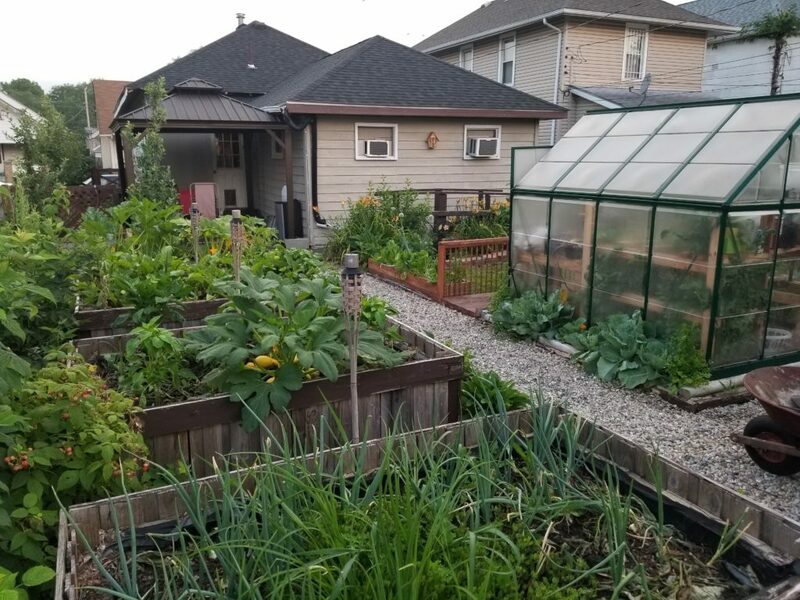 After watching how this family grew over 6,000 pounds of food on one-tenth of an acre, it sent me down a rabbit trail of searching out other urban homesteaders growing food right in their backyards. I found all the inspiration and motivation I needed to get started as soon as I was physically able. HH: How do you homestead while managing your budget? HT: My wife and I both still work full-time jobs while homesteading. I do still drive a truck for a living, but only locally, so I am now home every evening with weekends off to do our homesteading tasks. Homesteading actually lightened our budget in many ways. We save a ton on our grocery bills and have really adopted the frugal practices of reusing, repurposing and making the most out of what we have. HH: When and why did you decide to start your blog? HT: There were a couple reasons. I originally thought it would a be good way to document our progress as the homestead grew and changed over time, and we would be able to somewhat use it as a homestead journal to look back on the things that worked and the things that didn’t. I also had a strong desire to give back to others in the way I received it. It was others showing their homesteading lifestyle that inspired me to make the change, so I wanted to do my part to inspire someone else. A blog seemed like a good way to do that. HH: When and why did you decide to start your podcast? HT: A few months after starting my blog, I decided to start a podcast as well. As a truck driver, I have always loved podcasts as an educational and entertaining resource that can be consumed while doing other things. I had found a couple homesteading-related podcasts that I really enjoyed, but there wasn’t a whole lot out there compared to blogs and YouTube. It seemed like a better option for busy people to be able to get information, so I started the Modern Homesteading Podcast and just figured it out as I went along. HH: What have you learned about homesteading from doing your podcast? HT: I have always found that one of the best ways to learn something is to teach it. Preparing podcast episodes has taught me a lot because I have to do extensive research on the topics I’m discussing if it’s something i’m not already doing on my homestead. This approach has motivated me to try many new things and add quite a few projects to my homestead that I probably wouldn’t have had it not been for the podcast. HH: Any stand-out moments from your interviews? HT: I think the thing that stands out to me most about all the interviews overall is how different homesteaders are from one another, and yet so passionate about homesteading. The folks I’ve interviewed on my podcast have very little in common as far as backgrounds, training, religion, social and political views — and yet, they all rally around this cause of making their lives better, as well as making the world better, through homesteading. It’s really encouraging to see people coming together with one aim when the world seems so divided in every other way. HH: What are you doing on your homestead right now that you really enjoy? HT: It’s winter right now, and we have a few inches of snow on the ground and temperatures are in the single digits, so I’m finding the most joy in hanging out in the greenhouse. It’s a good feeling to go out there and harvest a fresh salad for lunch when the conditions are like they are right now. Last summer, I started dabbling with aquaponics also and I found I really liked how it worked for growing food in a quick and easy way. I imagine when it warms back up, I will be adding a few more aquaponics beds to the homestead and learning a bit more about that. HH: What do you hope for the future of your homestead? HT: My wife and I still dream about that homestead out in the country with lots of acreage, but we’re not forcing it. We are fairly content with what we have here. Right now, we are just focusing on getting healthier and spending as much time with our grandkids as we can on the homestead, trying to instill in them a love and passion for the lifestyle as well. Snapping green beans with my grandma on her front porch when I was a kid is still one of the fondest memories of my childhood. I hope the simple things we do will make that kind of impact them. This Q&A was edited for clarity and length.